A few weeks ago, I was invited over to Brioche Burger allllllll the way in Green Street. If you guys remembered, a couple of posts ago, I mentioned that I would cover that huge gaping hole on the East side of my HGAT map, and after my 1.5 hour journey to Brioche Burger, I now know why it took me so long. Of course, any long journey, especially to the East side, means I got to take BW out of his West End comfort zone! 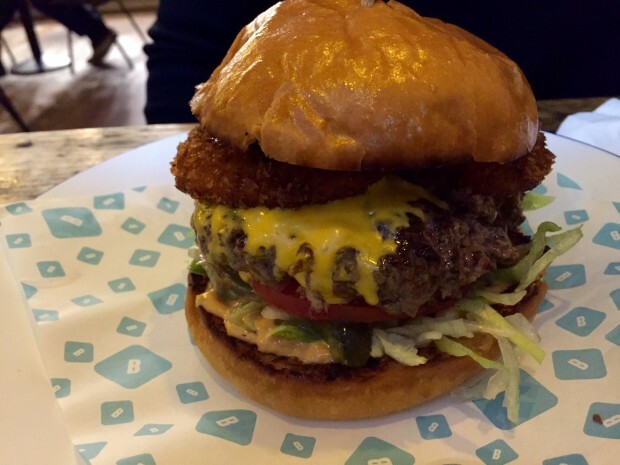 Finding Brioche Burger seemed a little testing but we finally realised it was situated inside a shopping complex. Walking in, the establishment had that familiar rustic feel with low light and wooden interior. Cosying into our seats, the owner, Fahad (hello! ), came over to say hi and get us settled in. From the above photo, you can probably see why sometimes I want to strangle BW. Not only did he decide to eat the wing clean to the bone, but he left it in the basket, so I apologise for that. However, I guess I don’t blame him for getting stuck in; the wings were really good. 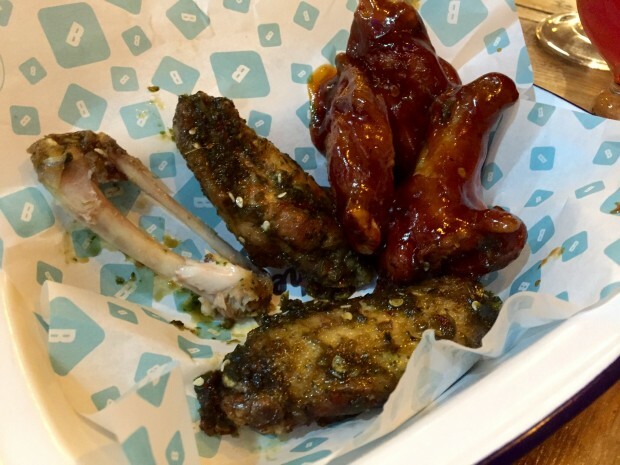 My favourite of the two was the dirty dozen; oriental-themed chicken wings that had been doused in a deliciously sticky and sweet sauce, sprinkled in crunchy sesame seeds, and had me licking my fingers. It tasted exactly like the kind of thing my mum would cook up and I just loved it! The other wings were flavoured in a sweet bbq sauce that had a small touch of chilli, but I’m not the biggest bbq flavour fan. I have to say, this was really, really tasty. 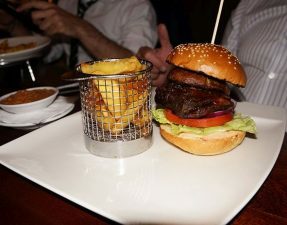 Using a combination of different cuts of 21 day dry-aged Angus beef, you could really taste the depth and earthiness of the burger patty which was great and moreish. The potato roll bun was soft, delectable, and big shocker, managed to hold the burger together, however the top half seemed a little small and squished. 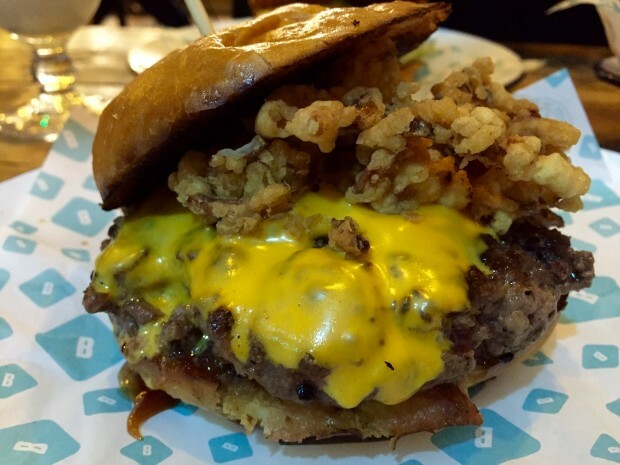 The crispy fried onions added a nice texture change to the burger, the cheese was delectably melted all over, and the sauce had a subtle sweetness. Overall, it was a good burger; not the best but sitting comfortably near the top. 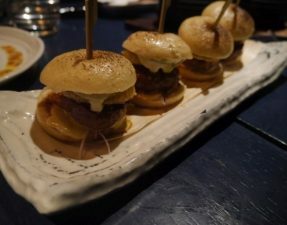 BW opted for one of the non-aged burgers from the ordinary menu, and it was really eye-opening to taste the difference between the two burgers. 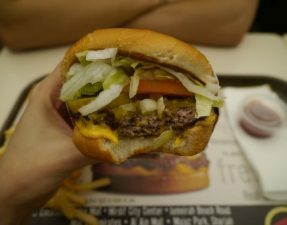 Whilst my burger had more intensity to the meat, BW’s was lacking that little bit of that oomph. The “Mad Man” had a lot going on from the onion rings to the double cheese, thus becoming a little heavy and inevitably falling apart. Whether that was caused by the fillings or the brioche bun itself, it ultimately became too messy to eat. 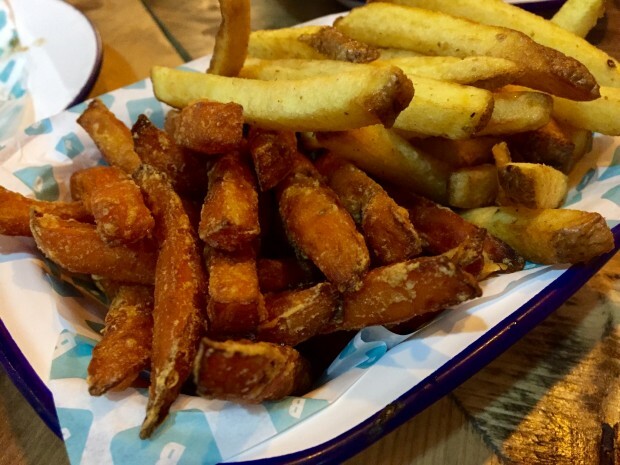 Both the sweet potato and normal potato fries were okay. 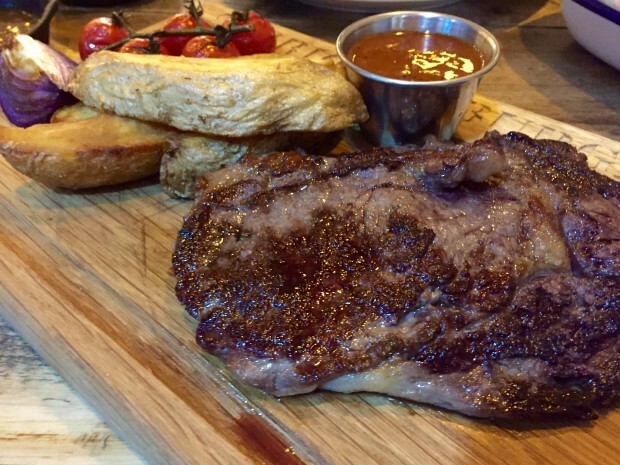 A huge piece of meat arrived on a chopping board with roasted vegetables and triple cooked fries, with a few sauces on the side. Phwoar, that rib-eye was humongous! Slicing it open showed an awesome bright pink medium (I compromised on cooking level for my lovely husband), and upon tasting it, I was sorely disappointed. 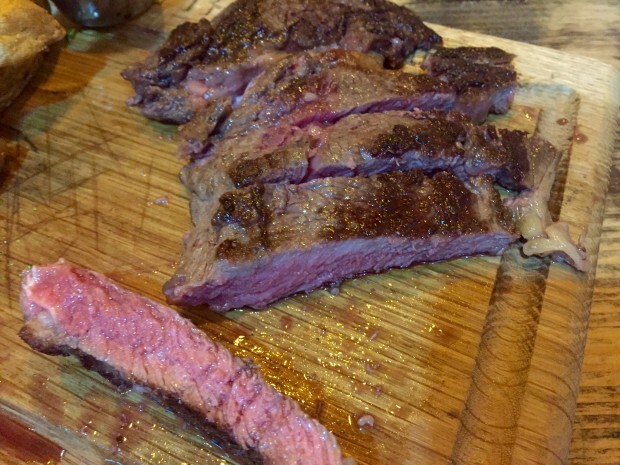 The steak needed a more flavourful crust and some more time on the grill to get a nice caramelisation and really bring out the aged flavour of the beef. The sauces were beef gravy, peppercorn sauce, and a Spanish chilli sauce. Our favourite of the three was the peppercorn sauce; nice and creamy, but needed a little more of that peppercorn sharpness. The Spanish sauce tasted good but was a little mismatched with the steak, we actually enjoyed dunking our fries in it, and the beef gravy was not something I would choose to accompany my steak as it was overall a little too meaty for my liking. The triple cooked fries were quite thick and stodgy and as a result didnt quite have that expected crunchy exterior. The roasted vegetables added a little breather from all the meat going on, but were nothing out of the ordinary. Maybe it was just BW and I, but we really liked the simplicity of this side salad. 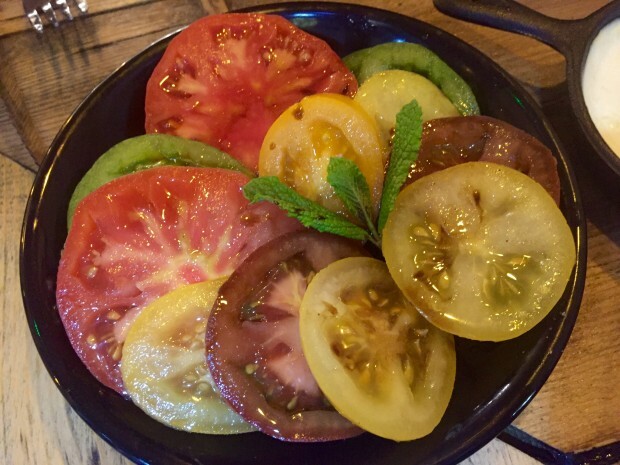 Just red and green tomatoes sliced up with a dash of salt and pepper – lovely and refreshing! 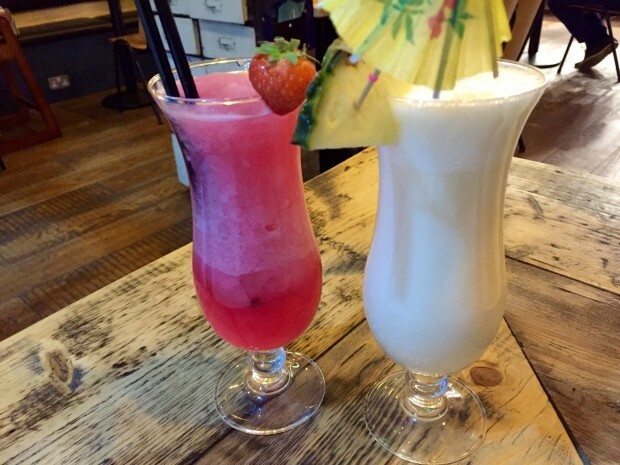 I’m a little picky when it comes to milkshakes; they need to have the right consistency and have the perfect ice cream to flavour ratio, otherwise it can be limp and milky. Trusting BB with their yummy sounding milkshakes, I chose an Alphonso Mango milkshake to go and omgoodness, it was probably one of the best decisions in my life. 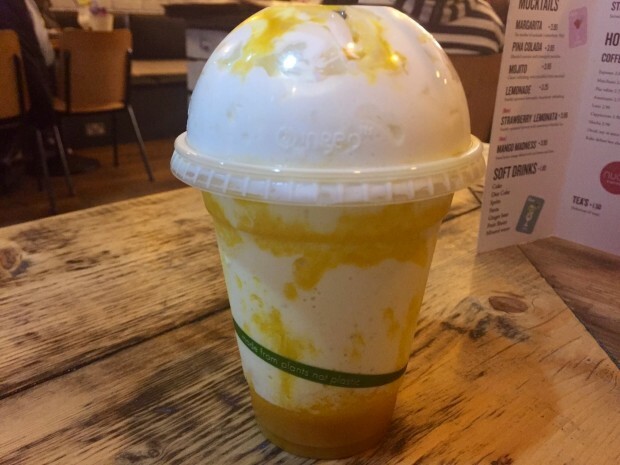 Thick, creamy shake with a generous drizzle of sweet mango sauce throughout, and topped with fluffy whipped cream; it was like drinking directly from a mango with a straw – amazing! 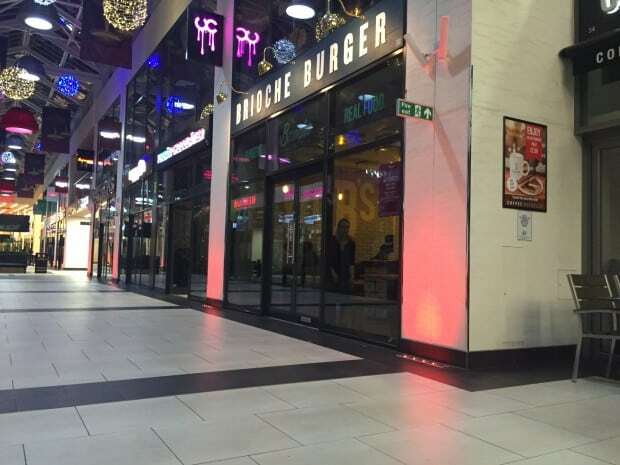 The total bill would have amounted to approximately £55 for two which would be £27.50 per person – an expected price to pay at one of these gourmet burger joints. Having introduced 21 day dry-aged beef to their menus will mean a massive superiority in their burgers – in terms of both flavour and quality – but this new change should also be reflected in their entire menu so that no comparisons are made between the two burger meats. Whilst my potato bun held the burger together, it became a little thin, and BW’s brioche bun caused the burger to fall apart. Moving on to the steaks, although a nice touch and change to the menu, the accompanying sauced need working on. Perhaps more focus should be on the burgers and sides instead to really perfect them first before taking on the challenge of steak too, but overall a good effort. the place has relocated to walthamstow. from what i hear the mall rents are ridiculously high and they dont get the footfall to justify the rents as the shops are hidden away indoors so passers by cannot see. i suppose its good they moved. i been to brioche twice i really liked it.